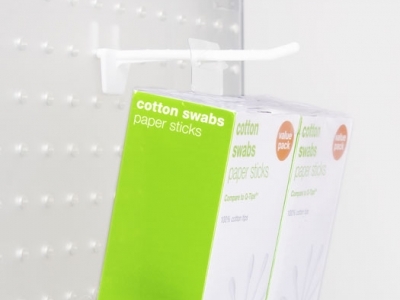 Do-It Corporation’s R-KGJ Fold-Up Style Hang Tab provides display exibility for Target’s Cotton Swabs 2-Pack. The hang tab stays neatly folded down during shipment and when displayed on a shelf. When desired, the hang tab can be folded up and the package can be displayed anywhere in the store.